Millennium has released the Are You Here trailer online. The movie centers on childhood best friends who go on a road trip after one of them inherits the estate of his late father. 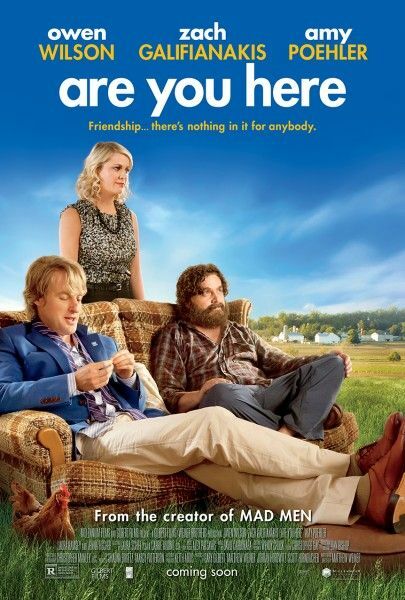 Are You Here is the directorial debut of Mad Men creator Matthew Weiner, and it stars Owen Wilson, Zach Galifianakis, and Amy Poehler, so you would assume it would be a popular film. Instead, when the film premiered at TIFF, the word was nothing but negative. I didn’t see the film, but I was told that there were plenty of walkouts, and judging from this trailer, it’s not too difficult to see why. It looks like a hodgepodge that’s trying way too hard to be funny and heartwarming. However, Weiner tells EW that the theatrical cut is “actually quite a bit different than it was at Toronto.” So maybe it will be good? Hit the jump to check out the Are You Here trailer. The film opens August 22nd.